Here is a peak at the shoes! I also bought a headband on a different day where the patterns are pretty much the same! I shall have to come up with a concept design! Let me know if you guys have any ideas! It would be great to hear from you! Ever since I saw the trailer for Castle in the Sky I was always intrigued by the story. It was only until much later that I actually saw the movie. Sheeta easily became my favourite character of the film and I loved the film! It is a really simple cosplay which made me decide that I should make it to practice my stitches and finishing of seams. 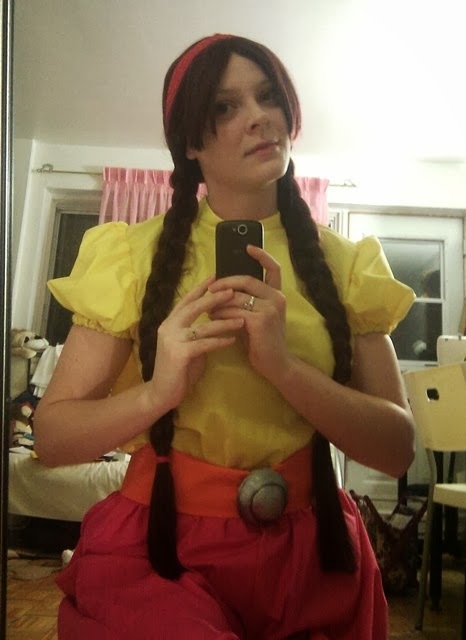 This is more of an exercise in sewing rather than a dream cosplay. I also wanted to have some comfy cosplays to wear around cons so this will be one of those! So this is something new that I'm adding to all my cosplays starting this year. I recently had to really buckle down on my spending money as I am a full time student and I didn't get a job last summer. I kept all my receipts and wrote down everything I spent. As I got used to this routine, I realized that I could probably go into a lot more depth in regards to cosplay. 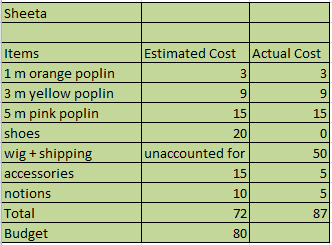 After watching a really handy video here, I decided that I was ready to start cosplay budgeting! 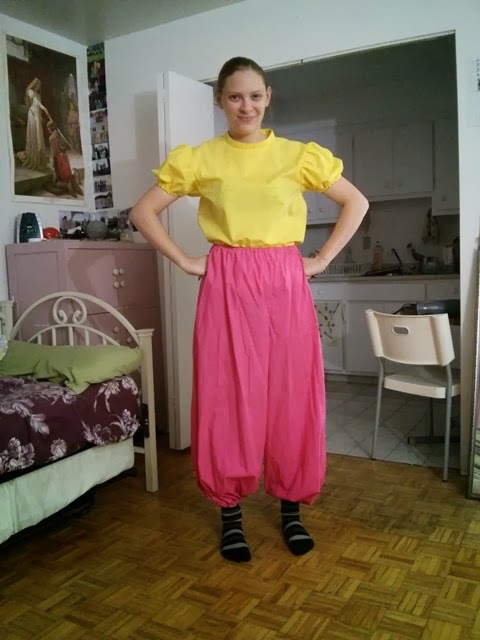 Pants - I used a bright pink poplin for the pants. 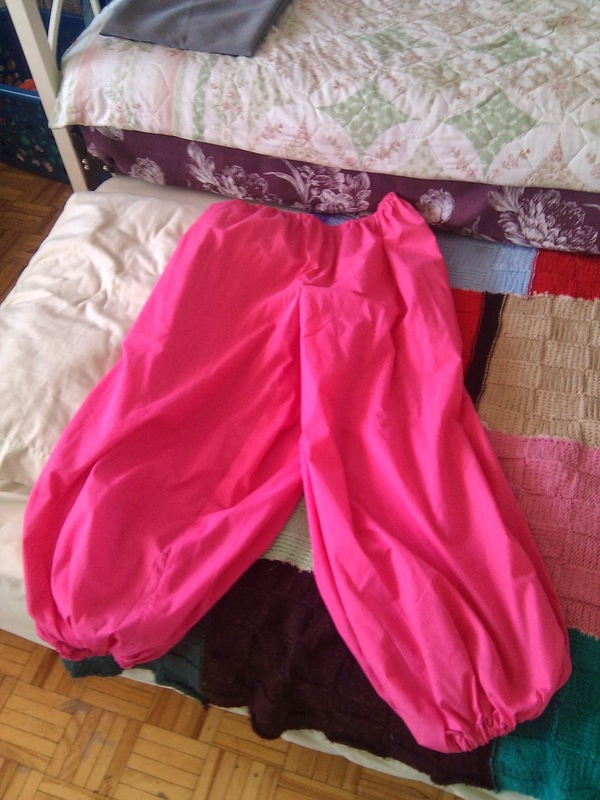 To draft the pattern I used my favourite poofy pants pattern as described here. Once again I made these pants big enough to fit two of me in them. I made them so that the waistband fit right on my waist rather than sitting on my hips. I used 1 cm wide elastic for all my gathering. Gathering the waistband and the ankles was a much easier process than my first encounter with this pattern. I didn't have to hand sew anything this time which was a relief. These pants took about three hours to make from start to finish. Shirt - I used a very simple pattern for Sheeta's shirt and altered the sleeves. I decided to make it very baggy as in the film she is handed the pirate clothes which are three times her size (although miraculously it looks like she can still fit in them). I used the pattern B5948 view F without the pocket. I made the sleeves puffy by following this tutorial here. The bottom of the sleeves are gather around an elastic to help with the puffiness. I might later on try and raise the sleeve as it is drooping of my shoulders right now. I added a mandarin collar as well that fastens by a strip of velcro in the back. Belt - The belt was drafted using a rectangle pattern made to fit my waist. I made the belt about 3 inches for the final width. The belt attaches by two hooks and eye closures. The buckle was made separately using Worbla. 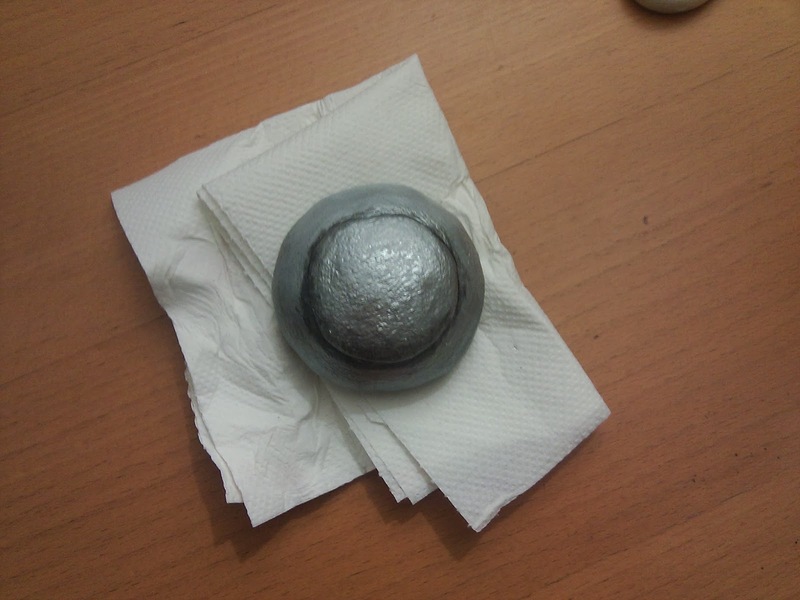 I made it spherical because to me it didn't look quite flat from the reference pictures I pulled up. The buckle just slides onto the belt. The belt buckle was primed with tow layers of gesso then two layers of silver paint (acrylic) were painted on top. The last layer consisted of some shadowing and highlighting by just using black and white and mixing them with silver. Shoes - I drafted my own pattern for the shoes. I followed a similar format to that of the jasmine shoes but without the curly toe. I choose a pair of old flats to use as my base. 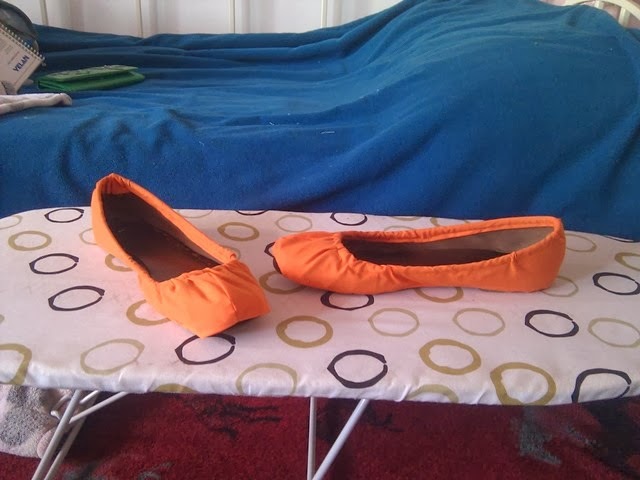 They didn't look very nice anymore but they are still wearable so I figured that I would give them a makeover :) I covered the shoes using the same orange poplin I used for the belt. They are sewn on (except near the front of the shoe, I couldn't get my hand in there). I am slowly gaining my experience in shoe covers! Wig - Sheeta's wig is awesome! I ordered a Leia wig from Arda Wigs in mahogany and it is gorgeous! It already came in the braids so I didn't need to style it. I cut the bangs using an old pair of fabric scissors (they are still sharp but I don't use them for fabric anymore). I made sure that I kept them long as the last time I cut bangs they turned out to be too short. Hair Accessories - I bought a simple red headband and used pink elastics at the end of her braids (I was too lazy to buy red ones or buy red ribbon).